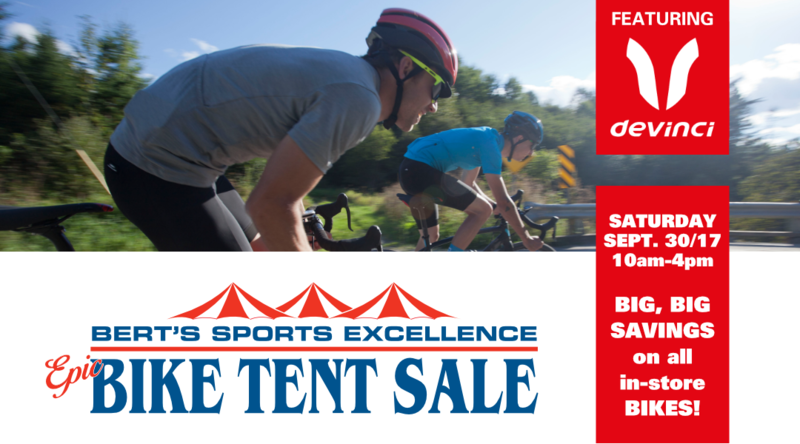 Come check out our 2nd Annual Bike Tent Sale, happening Saturday, September 30, 2017 at Bert’s Sports Excellence, 1211 Hurontario Street, Mississauga. We’ve for got big, big savings on all in-stock bikes, featuring Canadian made Devinci in plenty of models, sizes and colours. Last year’s event was a smashing success, so PLEASE VISIT EARLY for best selection of great bikes at great prices — offered ONE DAY ONLY at Bert’s Epic Bike Tent Sale. Now, that’s something to ride home about!